The Q Acoustics M7 is a beautifully styled, small yet hugely powerful music and home cinema 2.1 Bluetooth amplifier and speaker package. A fusion of the stylish award-winning 7000 series compact speaker system and a specially designed amplifier to deliver a 2.1 AV audio system that also excels as a pure Hi-Fi system. 2 x 50 watts of amplification with twin optical inputs, driving high quality speakers and the dedicated wall-mountable subwoofer, all available if black and white. The ease of use of a soundbar with the sound quality and stereo separation of a Hi-Fi system. A fusion of the critically acclaimed and highly awarded 7000i series and a dedicated stereo amplifier is the basis of the M7 2.1 stereo pack. It comprises of two award winning 7000i slim line speakers, the brand new 7060 subwoofer and a dedicated Q Acoustics amplifier. A stunning addition to your listening environment, with the option f complimentary stands for the two stylish speakers, the M7 is a true plug 'n' play product perfect for both a home cinema setup and main music system. 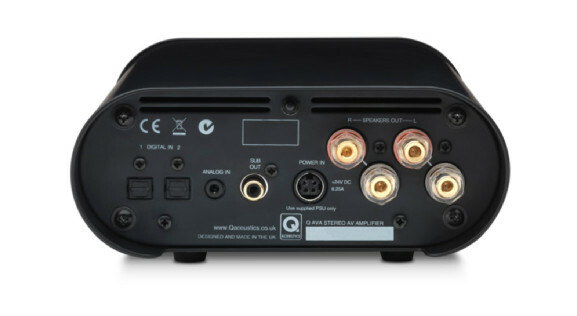 The heart of the M7 is Q Acoustics' new dedicated Q AVA stereo amplifier that delivers 50 watts of power per channel while a dedicated MoviEQ(TM) mode boosts the bass for even more cinematic sound. On board Bluetooth® allows you to wirelessly stream music from a smartphone, tablets or laptop. The amplifier features signal sensing automatic source selection and can be controlled by most Sky and Virgin remote controls so there is no disruption to your current viewing or listening set up. It also has its own small and neat IR handset. As the M7 is derived from the multi award-winning 7000i series, you can expand the system whenever you choose - create a 5.1 with the addition of a centre and two additional left and right speakers.